Friedrick August Hayek was an Austrian and later British economist and philosopher. He was awarded the Nobel Memorial Prize in Economic Sciences for his work on a theory of money and economic fluctuations that tied in an analysis of the interdependence of economic, social and institutional phenomena. He was a lead 20th century thinker that contributed to economics, systems, neuroscience, jurisprudence and history of ideas. It was these multiple vantage points of seeing the nature of society and its economic system that led to one of his most influential works Road to Serfdom. 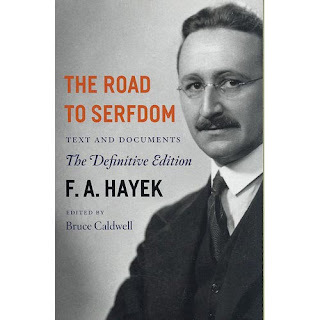 In his work the Road to Serfdom he argues the main points that the loss of individualism also means the loss of liberty, oppression, and the eventual serfdom of people. His argument is that as governments centralize their power they also create limitations on people to develop their economic abilities for the betterment of the nation. Even though centralization has good intentions it eventually limits the ability of people to compete. Development must come through the individual and contribute as an individual to the collective benefit of all. He advocates for a bottom (individual) upwards form of social structure versus a top (administration) moving downward which creates natural limitations. Centralized control can be seen as a function of GNP. As governments control higher levels of GNP they will naturally exert certain powers over the lives of individuals. This power creates structures within society that limit the abilities of individuals to manifest their individual destinies. It would seem that strong governments are those that maintain the lowest amount of GNP as necessary to complete their duties and functions. Beyond this, governments could be seen as having unnecessary control over markets. He argues that the only way to improve upon the betterment of people and the management of society is to push for truly free markets that enhance the ability of people to generate their own income. In this respect Hayek appears to have a level of validity in terms that true Capitalism is a free system whereby each person has an opportunity to produce income and is not thwarted by forced social adherence, policies that protect the conglomerates of companies or individuals, or in any way damage the ability of individuals to produce a living based upon their own skills and abilities. From Hayek’s arguments he does not believe government has no place in the market. Yet the government's role is confined to those things such as environmental protections, minimal safety nets, consumer protection, and labor rules that are considered fair and just. However, allowing special interest groups or companies to use government as another system of controlling people and their financial abilities to live free lives is a sure path to serfdom. Government should primarily concern itself with legislation that is necessary for the betterment of everyone and not continual consolidation of power and resources to control or manipulate markets. The book moves through a number of great chapters that include The Abandoned Road, The Great Utopia, Individualism and Collectivism, The Inevitability of Planning, Planning and Democracy, Planning and the Rule of Law, Economic Control and Totalitarianism, Who, Whom?, Security and Freedom, Why the Worst Get on Top, The End of Truth, The Socialists Roots of Nazism, The totalitarians in our Midst, Material Conditions and Ideal Ends, Prospects of International Order. After reading the book I find myself thinking about the importance of rewarding knowledge and performance in the marketplace versus social adherence. Government’s greatest responsibility would be to legislate only when it is necessary to maintain the free market (i.e. anti-trust laws) or when individuals are no longer free to make a living because of social, economic, or special interests. Laws are nation’s ethical standards and provide a framework for people to understand how to exist and compete in the market. If these laws unnecessarily protect certain groups from realizing their true potential or force a “status quo” on the population these laws should be removed as they limit the potential of a nation. An entire system will eventually collapse and become impoverished when individuals cannot scan their environments and come to the conclusion that their performance equates directly to their success. The more people who come to this conclusion the closer the population is to serfdom as people’s potential wanes against the need to maintain social structure. Motivation is an internal force that pushes to be realized in a receptive or unreceptive environment. If that environment forces compliance with lower standards and rigid social expectations the highest levels of performance can’t be realized.